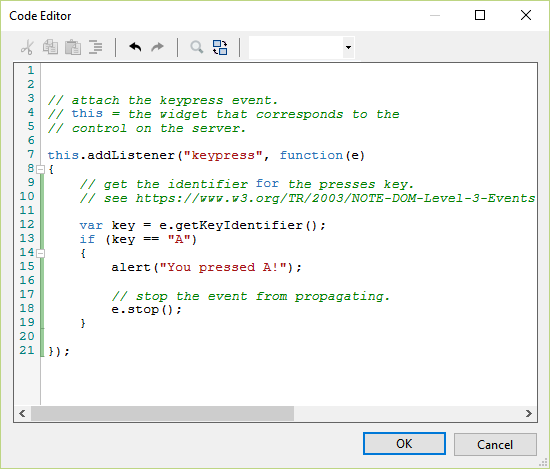 Keyboard events, like all events in Wisej, are routed to the server asynchronously. The Handled property is useful on the server side when managing the OnKeyDown/Up/Press events to signal that a child has handled the key. However, this has no effect on the client, unless you actually change the Text property to trigger a client update – I wouldn’t recommend this approach unless really necessary. Keeping the script above as a reference, we attach the “keypress” handler and handle the event. To stop it from both bubbling and “defaulting” use e.stop(). Otherwise you can use e.stopBubbling() and e.preventDefault(). we have logged this bug in our tracking system as WJ-7225. We will post a new answer here when it is resolved.